You CAN have style and safety all in one. 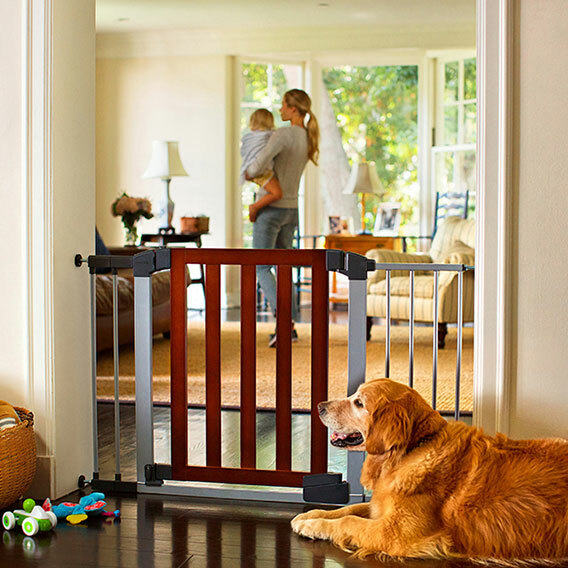 The Auto Close Modern™ Safety Gate by Munchkin is the ultimate in baby gate technology, with a sleek wood and steel design that keeps little ones safe without sacrificing home decor. Equipped with a unique gravity-fed hinge, the Auto Close does exactly what its name implies: it closes automatically when the handle is released. And with a little extra nudge in the right direction, the door stays open, because every parent could use an extra set of hands sometimes. Ideal for use in doorways, stairways, and halls, this tastefully designed infant gate stands 29" tall. For top of stairs use, use all four wall cups and screws provided. Follow all instructions provided in the instruction manual. This gate ships with a gap between the gate frame and the handles. This is not a defect.The gap will close once gate is properly installed. Children have died or been seriously injured when gates are not securely installed. ALWAYS install and use gates as directed using all required parts. STOP using when a child can climb over or dislodge the gate. Use only with locking mechanism securely engaged. NEVER use a gate to keep child away from pool. Install according to manufacturer’s instructions. Intend for use with children from 6 months through 24 months. This product will not necessarily prevent all accidents. Never leave child unattended. Do not use this gate at top or bottom of stairs without using all four wall cups. For maximum safety, use four wall cups with sticky pads and screws provided when installing the gate in all locations.